Teams of students square of in the CWRU Quidditch Club’s inaugural tournament on Van Horn field. Dozens of students straddle their brooms, the wind flying through their hair as they race towards the coveted quaffle. But these Quidditch players aren’t at Hogwarts. They’re not wizards, and they’re not flying through the air on the latest Nimbus broomstick. They’re muggles, at the Van Horn Field at Case Western Reserve University, running around with an everyday broom stuck between their legs. In 1997, the first ever Quidditch match was played in children’s minds all across the world, when the young wizard in “Harry Potter and the Sorcerer’s Stone” first mounted his magic broomstick. Not only did J.K. Rowling invent a world for readers to absorb themselves in, she invented a sport. Eight years later, in 2005, students at Middlebury College in Vermont organized the first ever real-life Quidditch game. Since then, the game has steadily caught wind, with hundreds of schools participating across the world. On Saturday, the sport found its way to CWRU. Eight teams from all across campus, all new to the sport, came together to fight for the grand prize: a $750 donation to the charity of their choice. 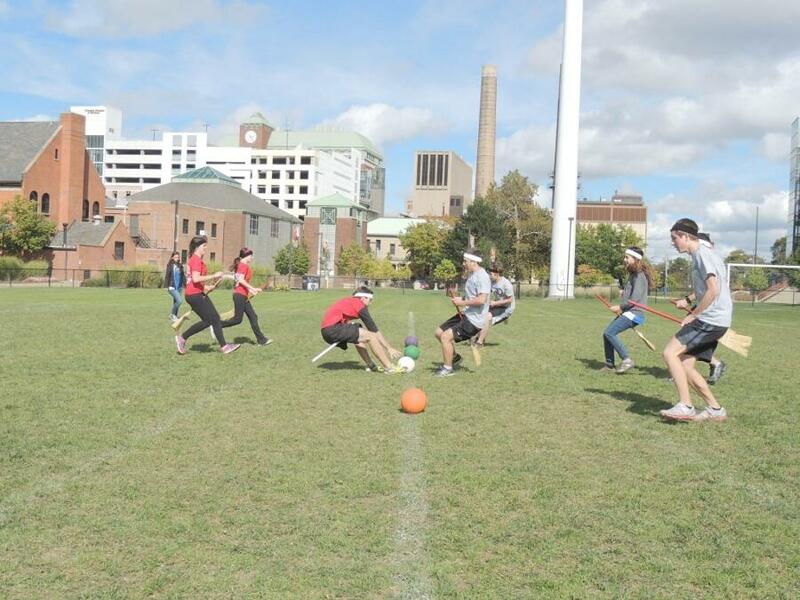 The tournament was planned by the CWRU Quidditch club. Since most of the participants had never played before, the coaches from CWRUCIO, the Quidditch club’s team, had to guide them. “A broom is just an extension of your body,” joked one coach. Even with their lack of experience, most players got the hang of the sport within the first round. The taller players were quick to block the quaffle, the volleyball used to score points in the game, from entering the homemade hula-hoop goals. Within minutes, people weren’t tripping on their brooms. One of the teams playing, Unix Felicis was the only team named from the books. The team, made up of members of CWRU’s Hacker’s Society, chose their name as a play on the magic potion, Felix Felicis, that brings the drinker luck for the rest of the day. Since the team was made up of computer scientists, they combined this with Unix, a computer operating system. “Running with a broom between my legs is not something I do on any day of the week,” added Alex Letwin, a senior who played on a team made up of members of Pi Beta Phi and Beta Theta Pi. The CWRU Quidditch club began in 2012 with junior Tasha Smith. Smith has been an avid Harry Potter fan for most of her life. She loves the books, the characters and other people who love the books. She constantly makes character connections, Harry Potter metaphors, and owns a Bellatrix costume that she’s had for eight years. The books influenced her the “same way you would expect [them] to influence any massive nerd,” she said. But the Quidditch club isn’t just for Harry Potter fans. The club is one of the only non-Greek organizations on campus that regularly mixes athletic and social events. They hold full practices twice a week, but also hold Harry Potter parties, such as the Yule Ball, which they host in the spring. There’s even a member that has never read the books or seen the movies. Even so, the member is an excellent Quidditch player. After four hours of broom riding, quaffle catching and snitch chasing, the Beta Theta Pi and Pi Beta Phi team won the final game. As Quidditch champions, the team donated the $750 prize to the Diabetes Partnership of Cleveland and Pi Beta Phi Foundation, the respective philanthropies for each organization. Despite having a lucky name, Unix Felicis lost both games in the round-robin battle among the final three teams. In the end, they just needed a little bit more magic.